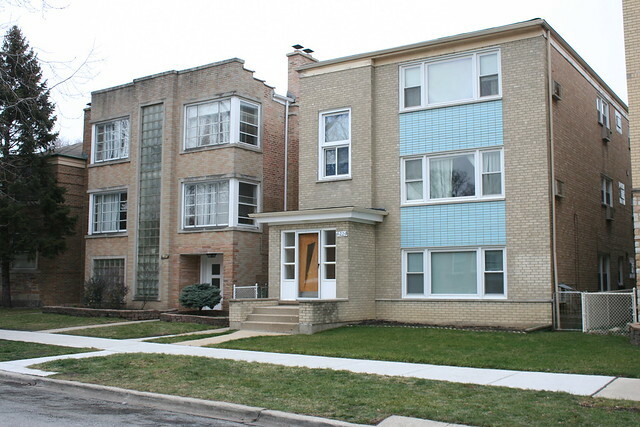 I’ve never been shy about loving the Chicago Mid-Century 3-Flat**. I love how within such a simple form there are endless varieties of decor – variations on materials and colors, with ornament ranging from glass block to elaborate wood doors, ironwork porch columns and built-in planters. I love how you can find entire blocks of the things, marching along with a repeating rhythm – same height, same width, same spacing, same setback, same design vocabulary – and no two are the same. I’ve found only a handful that use the blue-on-blonde brick color scheme. They are simple creatures; the only place the blue brick appears on these buildings is in horizontal panels between the main windows. The standardized blue-on-blonde vocabulary that appears all over Rogers Park is not used on these structures. There are no corner piers, no grids of squares or single bricks floating on a field of beige, no horizontal or vertical bands – just a couple of big panels that work to group the large picture windows into a single element. 3-flats have their own vocabulary of style, and the blue brick becomes simply one option out of a whole range, rather than the basis for a group of elements. 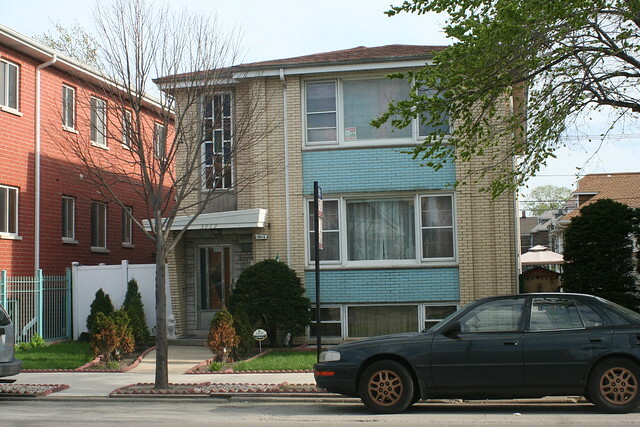 3006 W. Touhy Avenue, West Ridge – Chicago. Opened by 1964. This one had its blue brick covered up or replaced with some kind of Permastone-like facing between 2009 and 2011. That’s not to say there’s nothing else going on on these buildings. They have a variety of massing elements, main doors, storm doors, stairwell decorations, and entryway variations. It’s just that none of those elements are distinctive to the blue-on-cream color scheme; they all appear on all kinds of 3-flats in all kinds of colors and materials. 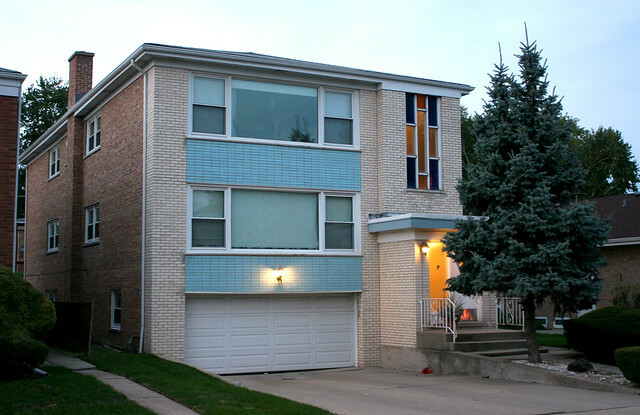 3919 W. 47th Street – possibly 1961 by Wiercioch Brothers. A delightful assemblage of parts – raised piers, gray flagstone at the door, angled brick canopy walls, an angled canopy roof, and rainbow-hued plastic windows over the stairwell. And anyway, this color combo does look pretty sharp – very fitting for the dressed-up era of JFK and Mad Men. 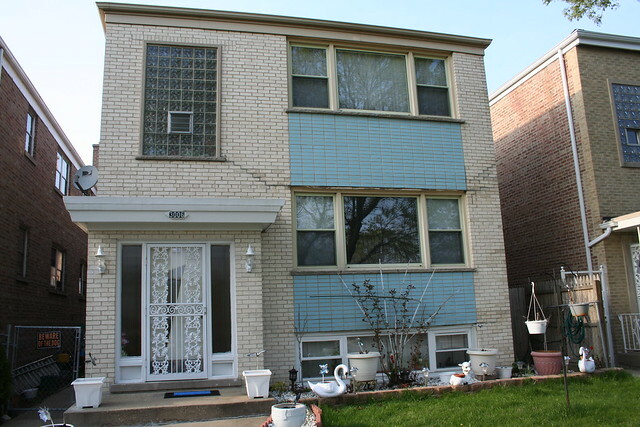 6229 N. Whipple Street, West Ridge – Chicago. With a stylish Moderne building next door. 6052 N. Fairfield, West Ridge – Chicago. Opened 1965. Very often, they’d drop a garage door down in the basement, rather than having a full basement or third apartment. This sometimes created rather awkward front yards. 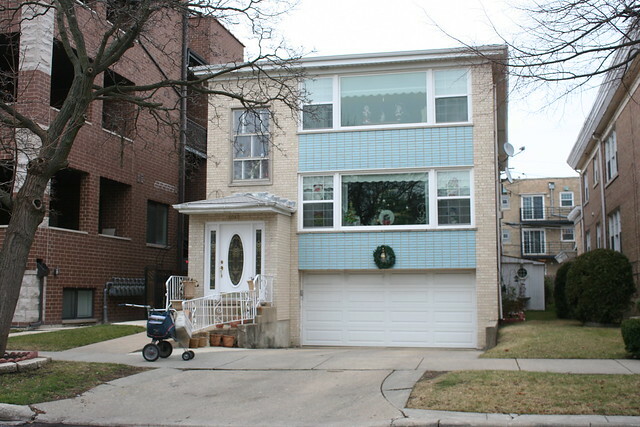 3321 W. North Shore Avenue – with a garage in the place of the basement. This building faces a near-twin directly across the street. 6049 N. Richmond, West Ridge – Chicago. Opened 1964. 6100 N. Artesian at Glenlake – curiously, the entry door is on the side of the vestibule, facing the away from the main facade. 3510 W. Main Street, Skokie – opened 1964, by Birger Construction, who did another blue-on-blonde at 1322 W. Chase. It sports the same kind of colored plastic windows as the 47th Street building. 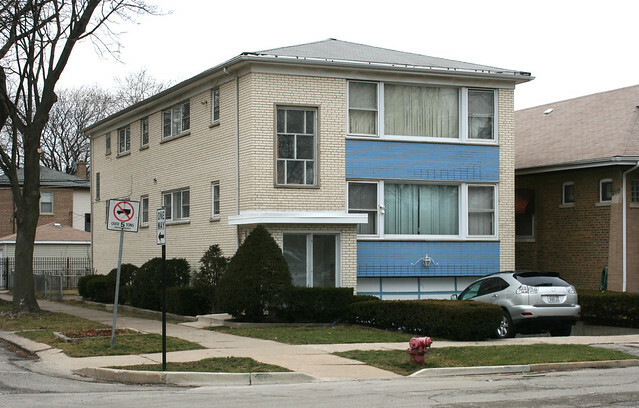 If blue-on-blonde flats are uncommon, then single family houses using the scheme are vanishingly rare – to the point that this is literally the only one I’ve ever documented. 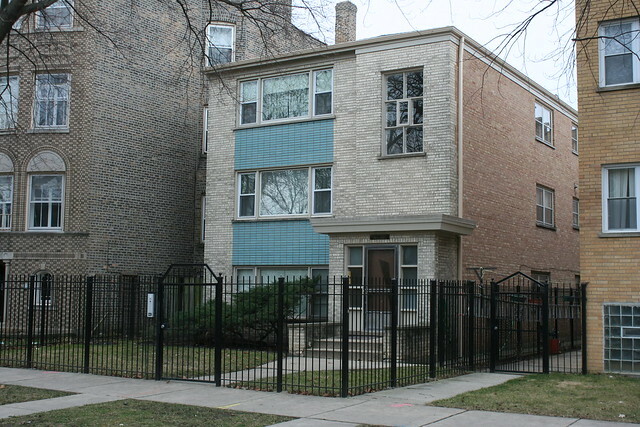 5300 N. Melvina Avenue – western single-family. It’s a lovely little raised ranch house, with blue lining the doorway and connecting the basement windows with the large picture window above, and a couple of decorative colored glass blocks by the door. The blonde brick is Roman brick – longer and thinner than the normal 4×8 brick. One final side note – in researching all these buildings, I finally figured out that advertisers back in the day referred to the blonde brick as “yellow brick”. It’s not really yellow, but I guess the name made more sense to people; it shows up in many real estate ads, so it must have been considered virtuous – clean and modern, if I had to take a stab at it. ** I use “3-flat” to mean both 3-flats and 2-flats, because for discussion purposes they’re the same thing – two stories above ground, one half-basement level below. Whether that lower floor is a standard basement or another apartment generally doesn’t have any influence on the building’s massing and decorative style. This entry was posted in 1960s Glazed Brick, Mid-Century Apartments and Flats. Bookmark the permalink. I’ve never been inside one of these buildings. Do the interiors have anything special going for them as the exteriors do? An excellent question. I’ve never been in any of the apartments either. At a guess, I would say no. Advertisers sometimes touted things like “color fixtures” (ie salmon pink countertops or sea green toilets), as well as a range of what were then modern appliances, all of which would probably look pretty funky to our eyes today – if they survive to the present day, which… probably some do and many do not. Otherwise the big attraction would have been the huge picture windows (notice that some are pretty stingy with windows on the sides), and just the general newness of them. Maybe a more open floor plan than older city apartments too. Thanks for these interesting posts. I’d forgotten about the blue-on-blonde Chicago buildings. And thanks for reminding me of the “three-flat” and “two-flat” terminology. Here in Toronto, theyre triplexes and duplexes. I don’t think I’ve seen any blue-on-blonde here, but I just moved out of the top floor of a triplex (early 60s vintage – maybe late 50s) where the interior was still from the 50s: pink fixtures in the bathroom, a lazy-susan cupboard in the kitchen, a peninsula (not island) countertop and cupboards in the kitchen and a half-wall in the living room with shelves for knick-knacks. I loved those touches – even the pink bathroom. I had a pink bathroom once before, but the wall tile was maroon and black so it had a quite depressing vibe rather than this latest one’s perky pink feel. American houses are so different from UK houses! They always seem a lot more appealing I must say. Since reading this article, I’ve had my eye out for another blue/blonde single family home, and think we may have a winner. I’m not sure of the exact address (drove by quickly this morning) but searching StreetView for 2934 W Estes, 60645 will get you there. Wonderful blog… I hope you keep up the good work as long as possible! I grew up in Lincolnwood and now live in Los Angeles. 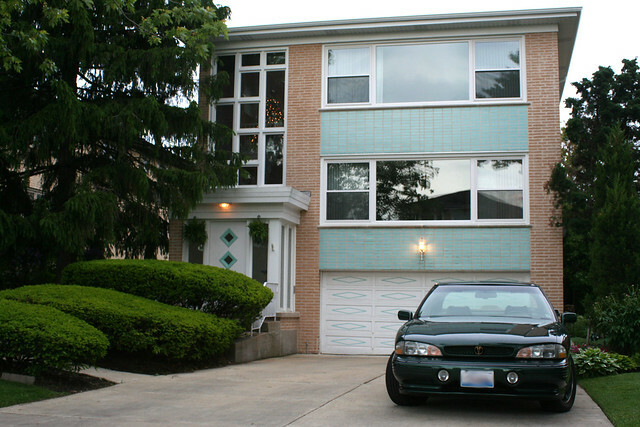 This is a great blog for exploring ALL the types of architecture found in Chicagoland. There is so much emphasis on only talking about the buildings along the lakefront. the “stock” buildings of your city. Thank you again for your great creation. such as wood or aluminum.